Times of Malta 16/02/2014: Malta ranked 17th in tax revenue as a percentage of GDP in 2011 – at 34.8 per cent, well below the EU27 average of 40 per cent. The figures released by Eurostat show that the percentage grew from 31.2 per cent in 2011 to a peak of 36 per cent in 2007, fluctuating since then. 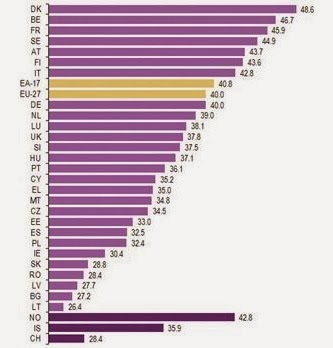 The ratio of tax revenue to GDP was highest in Denmark, Belgium and France (48.6 per cent, 46.7 per cent and 45.9 per cent respectively) while the lowest shares were recorded in Lithuania (26.4 per cent), Bulgaria (27.2 per cent) and Latvia (27.7 per cent). The effects of the economic and financial crisis on tax revenues from 2007 onwards are apparent across the EU. From its last spike in 2006, the ratio of tax revenue to...read on.